Before he became Vice President of the United States, Joe Biden spent his time studying history and political science at the University of Delaware, the largest university in America’s oldest state. Admittedly, the cost of a college degree has risen considerably since Biden graduated from Delaware in 1965. But with schools like the University of Delaware, Delaware State University, and Wilmington University offering more money in scholarships now than ever before, you shouldn’t let the sticker price of a degree discourage you. Whether you plan to go to college in Delaware or somewhere on the other side of the country, there are plenty of ways for you to reduce the cost of a college education. Here are the four steps you should take to start creating your college funding plan. The first step any U.S. resident should take towards paying for college is completing the Free Application for Federal Student Aid, more commonly abbreviated as the FAFSA. We’ll come right out and admit it: the FAFSA isn’t exactly a joy to complete. However, it’s essential to fill out the FAFSA if you’d like to be considered for federal or state financial aid. Our handy FAFSA guide breaks down the form question-by-question and is a great resource if you find yourself getting stuck. You don’t need to know where you’re going to college in order to fill out your FAFSA — in fact, it may be in your best interest to fill it out sooner rather than later. That way, you won’t risk missing out on grants or scholarships that have earlier application deadlines. As we stated above, your completion of the FAFSA will automatically determine your eligibility for some federal and state-funded grants and scholarships. However, Delaware offers a number of state-sponsored scholarships based on merit and financial need that may require additional applications. Although the FAFSA is essential for all of the scholarships listed above, they all require additional materials to apply — some ask for official test reports and personal essays as well as their own application form. The sooner you look into these scholarships, the more time you will have to make sure you have all the materials you need to apply. If you’re already out of high school, you might be interested to know that Delaware is taking strides to make it easier than ever for adults to continue their education. The Governor’s Workforce Development Grant for Working Adults grants adults who previously earned a high school diploma or GED up to $2,000 to go back to school part-time while continuing their work. There is also the the Governor’s Education Grant for Unemployed Workers, which helps individuals who’ve lost their jobs learn or strengthen a skill to get back on the road back to employment. With so many scholarships to keep track of, the best way to stay up to date is by setting a reminder in your calendar to check in regularly with your school guidance counselor. They often serve as the liaison between grant-giving organizations and eager students, so it’s important to keep the conversation rolling as scholarship applications become available. You should also try doing some grant and scholarship research of your own. Most schools in Delaware offer scholarships to incoming freshmen, but many scholarships require additional forms beyond your admission application. You can try searching the financial aid sections of school websites and call their financial aid offices directly to gain more information. You can also view a list of Delaware scholarships in alphabetical order or by application deadline, courtesy of the Delaware Scholarship Compendium. Websites like Sallie Mae’s Scholarship Search and Scholarships.com allow you to run broader scholarship searches by location, academic interest, extracurricular activities, and more. Additionally, we offer our own scholarship database, and every quarter we also offer a Nitro Scholarship and Nitro Parent Scholarship. All U.S. residents and parents of residents attending their first year of college are eligible and encouraged to apply. If you’ve exhausted all resources for grants, scholarships, and federal loans, a private loan may be just what you need. 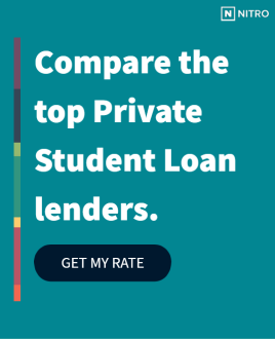 Check out our side-by-side comparison of the best banks for private student loans to find out where you can get the best rates. Before you take out a private loan, take a look at our free NitroScore tool to assess your loan options. All you have to do is enter your desired college, major, and available funds from scholarships, grants, and savings. You’ll receive a score that will help you determine how easy or hard different loans will be for you to pay off. All Delaware residents deserve a chance at a college education, and there are plenty of well-financed organizations that want to help make college a reality. Give yourself the best possible future and start applying for funding today.